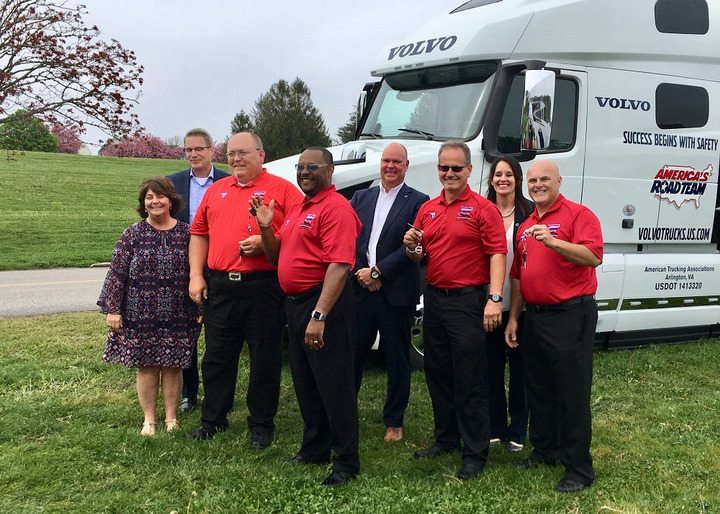 Volvo Trucks North America presented a new Volvo VNL 760 to representatives of the America’s Road Team program, reinforcing the truck maker’s support for the American Trucking Associations' safety outreach campaign. The Road Team Captains will drive the donated VNL 760 with ATA’s Interstate One mobile classroom trailer all over America, meeting legislators and the public to highlight the trucking industry’s commitment to safety. The 53-foot show trailer is equipped with a conference room, seven presentation screens, a truck driving simulator, and educational displays to help Road Team Captains deliver the message of safety and the importance of trucking in daily life. The donated VNL 760 model is equipped with active safety technologies such as Volvo Active Driver Assist with Bendix Wingman Fusion fully integrated into the Driver Information display. It also features Volvo Enhanced Stability Technology and a lane departure warning system. The tractor is powered by a Volvo D13 engine and is equipped with a 12-speed Volvo I-Shift automated manual transmission. Volvo’s connectivity services, Remote Diagnostics and Remote Programming, are supported by Volvo Action Service agents. America’s Road Team is a national public outreach effort led by professional truck drivers who have demonstrated their commitment to safety and have logged millions of accident-free miles. The ATA created the America's Road Team in 1986, and Volvo Trucks North America has been the exclusive sponsor of the program since 2002. “America’s Road Team Captains speak to tens of thousands of people every year about the essential and safe role the trucking industry plays in the American economy, and being able to showcase industry-leading equipment like the Volvo VNL 760 really helps reinforce our message,” said Chris Spear, ATA president and CEO. “Volvo Trucks’ generosity is deeply appreciated by ATA and goes a long way toward helping us reach our goals as an association."